You might not have seen any adverts for it yet, but the 2013 Ford Escape is already flying out of dealer lots. That's not bad when the auto market is currently undergoing a summer slump, but the first all-new Escape in over a decade really seems to be grabbing the attention of buyers. The Escape's early success probably isn't that much of a surprise. Despite lacking a hybrid model as seen in the last generation of Escape, the new model comes with a wide range of fuel-efficient engines, including two new EcoBoost units. Ford's increasingly ubiquitous 2.0-liter EcoBoost sits under the hood of the top-spec Escapes, delivering 22 mpg city and 30 mpg highway, for a 25 mpg combined rating. Four-wheel drive versions are a little more thirsty. It's peppy though, producing up to 240-horsepower. Green-minded buyers will be most interested in the 1.6-liter EcoBoost. Despite making over 170-hp, front-wheel drive Escapes can achieve 33 mpg on the highway, with 23 mpg city. Base-model Escapes come with a 2.5-liter Duratec engine, and make 31 mpg on the highway. Some fans may be disappointed that the hybrid has disappeared, particularly since it managed up to 34 mpg in the city. However as a whole, the Escape range now uses less gas than it did before. It's also hit the market at the right time, as compact crossovers are really taking off in popularity. 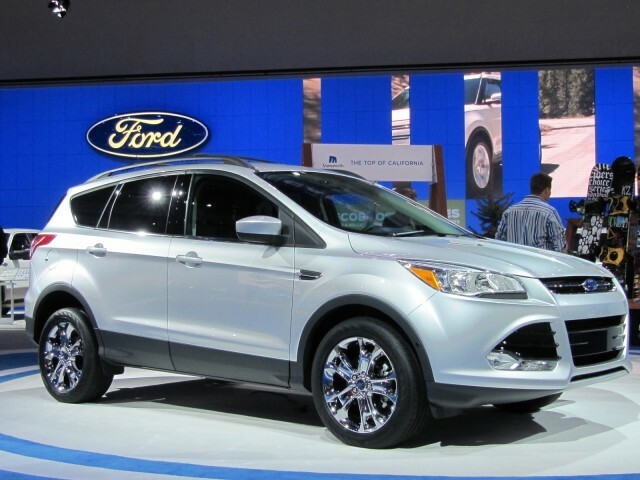 And if that wasn't enough, the new model, based on Europe's Ford Kuga, is also a looker. While the Escape is selling well, Ford's sales are only marginally greater than they were at this point last year, reports The Detroit News. Estimates range between less than 1 percent, and up to 4.4. General Motors and Chrysler will see increases of up to 8.2 percent and 19.2 percent respectively.